My reviews of Rush’s live albums are going to be a bit different from their studio albums. Because I’ve already gone over the individual songs and their meanings in the studio album reviews, I’m going to talk more about overall production and performance quality when it comes to the live records. Basically, I’m going to talk about the experience rather than analyze individual tracks. So bearing that in mind: Rush’s “All The World’s A Stage” was released in 1976 after their successful tour supporting “2112”. Recorded over three nights in June at Massey Hall in the band’s hometown of Toronto, it showed Rush in a very celebratory mood. “All The World’s A Stage” would be the band’s first Top 40 album, and would be certified Gold in November of the following year, the same time as “2112” and their follow-up album “A Farewell To Kings”. The first side packs the biggest punch, opening with three of the band’s best tracks from this era: “Bastille Day”, “Anthem”, and “Fly By Night” (segueing into “In The Mood”, much to my dismay). Even when the band gives the audience a chance to catch their breath, playing “Something For Nothing” and “Lakeside Park” before whipping “2112” at them (minus the “Discovery” and “Oracle: The Dream” sections), the energy is palpable and infectious. Things get particularly wild with Alex’s echoing guitar solo during an extended jam on “By-Tor & the Snow Dog”, and Neil sneaks his drum solo into the medley of “Working Man” and “Finding My Way” on the second half. Putting weaker songs like “In The End” and “What You’re Doing” makes the show lose momentum somewhat, but the performances are consistently strong and keep you excited. 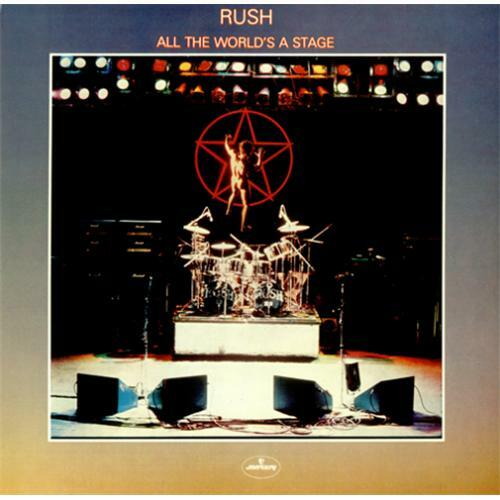 Of all of Rush’s live albums, “All The World’s A Stage” is perhaps the most raw. You hear squealing microphone feedback more than once, and the band doesn’t miss the opportunity to go off book and jam. Considering how the band would tighten things up on tour after this though, that makes this album a bit special and even intimate. The crowd’s excitement is essential to this record, and presents the band at their most bare-bones. The liner notes refer to this as “The end of the first chapter of Rush”, and the album literally ends with the sound of the band closing a door. Given the directions the band would take musically after this, Rush was putting their days as a Toronto pub band behind them before moving onto their more ambitious arena rock. Though this era would yield their more successful and seminal material, it’s clear the success of “2112” had the band feeling kind of wistful before moving onto greater things.